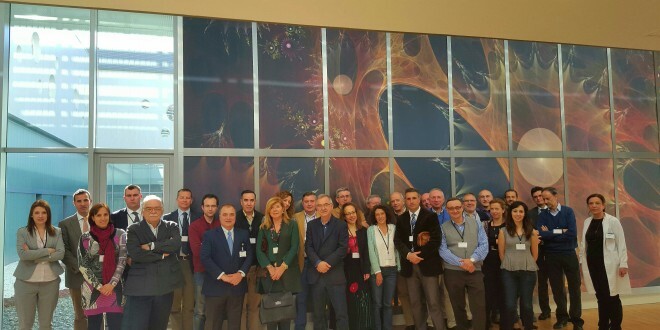 It took place the visit to INMUNOTEK of representatives of TecnoAlcalá (Madrid Activa) and research groups at the University of Alcalá under the 5th TecnoAlcalá – UAH Innovation Day. These meetings have been created by Madrid Activa (Science and Technology Park of the University of Alcalá), and coordinated by the OTRI (Transfer Research Office) of the University of Alcalá, which aims to present the activities of companies in the park and create synergies among those present. The general director of Madrid Activa, Ms. Maria Luisa Fernandez and the coordinator of the OTRI, D. Antonio Abellan opened the day, then the medical director of INMUNOTEK, Dr. Miguel Casanovas explained in detail the structure and operation of the company and showed close activity in their laboratories.